A large part of the land south of Pretoria is underlain by dolomite from the Chuniespoort Group of the Transvaal Supergroup. In South Africa, dolomite rock has a notorious reputation for the formation of sinkholes and subsidences. Thousands of people reside and work in the Centurion area, where numerous sinkholes have occurred, causing damage and in some instances loss of property and even lives. Centurion has rapidly densified over the last 40 years, with an increase not only in the number of people, but also in the density of waterborne services. This paper proposes draft guidelines for the allocation of an Inherent Hazard Class for percussion boreholes, referred to as the 'Simplified Method of Scenario Supposition'. This method was then used to classify the Centurion CBD and surrounding area. The greater part of land in the area directly south of Pretoria is underlain by dolomite from the Chuniespoort Group of the Transvaal Supergroup. In South Africa dolomite rock has a notorious reputation for the formation of sinkholes and subsidences. Thousands of people reside and work in the Centurion area, where numerous sinkholes have occurred, causing damage and in some instances loss of property and even lives. Standard practice in South Africa is to execute geotechnical investigations on all dolomitic land earmarked for development, irrespective of the type of development. Dolomite stability reports are submitted to the National Dolomite Databank at the Council for Geoscience (CGS). It is apparent from the available dolomite stability reports submitted over the last 30 years, that hazardous conditions exist in the Central Business District (CBD) area of Centurion, Pretoria. Centurion has rapidly densified over the last 40 years due to its locality between Johannesburg and Pretoria. The Gautrain train route now traverses the Centurion CBD area, and the Centurion Station area around West Street has attracted high-rise developments. This will lead to a further increase in population, with associated increased road traffic and density of people per hectare. The available data, comprising 3 587 percussion borehole profiles from 555 dolomite stability reports, could be used to attempt a first-order sinkhole hazard analysis. The generally accepted current method used to determine the sinkhole hazard is the so-called 'Scenario Supposition Method' (Buttrick et al 2001). This method is incorporated into SANS 1936-2:2012 (SANS 1936), since the principles of this method are currently most commonly being used by practitioners in South Africa. The Centurion CBD is demarcated by John Vorster Road in the south, Jean Avenue in the north, the N1 highway in the southeast and South Street in the east. 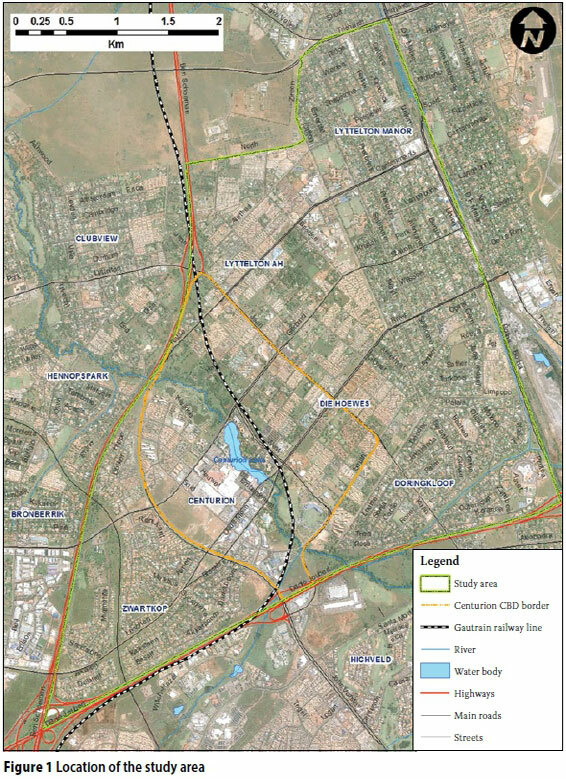 The study area includes some of the surrounding suburbs, and is bounded by Trichardt Road in the north, Botha Avenue in the east, the N1 highway in the south and the N14 highway in the west (Figure 1). The study area covers a surface area of approximately 1 657 hectares and is relatively flat-lying, sloping gently towards the Hennops River which cuts through the centre of the CBD. The majority of the CBD and surrounding areas is developed, with commercial developments around the Centurion Lake and residential development in the surrounding areas (Figure 1). Most of the CBD area is underlain by chert and dolomite rocks of the Monte Christo Formation, with the Lyttelton Formation present along the eastern boundary of the study area, and the Oaktree Formation occupying a small area in the southern corner. Dolomite from the Lyttelton and Oaktree Formations are generally chert-poor compared to the chert-rich Monte Christo Formation. Syenite intrusions in the form of sills and dykes are present in the dolomite bedrock, and a specific large syenite sill is present towards the southern boundary of the Centurion CBD area in Zwartkop. A prominent north-south trending dyke is present along the eastern boundary of the CBD, with a smaller northwest-southeast trending dyke in the Lyttelton Agricultural Holdings. Alluvial deposits occur in the Hennops River floodplain and a small Karoo outlier (Vryheid Formation) is present on the northwestern boundary. The Centurion CBD area is situated in the Irene catchment which comprises four sub-catchments, or compartments which are hydraulically connected, as evidenced by the direction of groundwater flow (Hobbs 1988). The four sub-catchments are analogous to the Fountains West, Fountains East, Doornkloof West and Doornkloof East compartments described by Vegter (1986). Most of the CBD area is situated in the Fountains West groundwater compartment. Hobbs (1988) indicates that an extremely weak groundwater gradient of some 0.2% is manifested from immediately north of the Hennops River in a north-north-easterly direction towards the Fountains West spring, indicating a high transmissivity of the dolomite aquifer in this sub-catchment. According to a groundwater level contour map by Hobbs, the groundwater level of the Fountains West groundwater compartment in this area ranges from 1 416 mamsl in the south to 1 385 mamsl in the north. This constitutes a range of 48 m below ground surface in the south to 91 m below ground surface in the north. The Fountains East groundwater compartment is present along the eastern boundary of the CBD area. This compartment drains in a north-westerly direction to the East Fountain Spring in the north (Hobbs 1988). According to Hobbs, the groundwater level of the Fountains East groundwater compartment in this area ranges from 1 429 mamsl in the south to 1 425 mamsl in the north, indicating a relatively flat ground-water level across this compartment. The groundwater level of the CBD area therefore ranges between 16 m below ground surface in the south to 20 m below ground surface in the north. Recent groundwater studies for specifically the Gautrain Rapid Rail and other developments in the Centurion area revealed that groundwater abstraction (mainly by the municipality) does not have an influence on the aquifer, as the Irene catchment is in a relatively undisturbed condition (Ove Arup 2009). Some localised lowering of the groundwater level has been observed in the area of the Kentron borehole where water is abstracted by the municipality, but this borehole is situated in the Doornkloof West groundwater compartment, which does not form part of the study area. Groundwater monitoring borehole A2N0528, situated towards the west of the CBD area, also shows a relatively stable groundwater level (with seasonal fluctuations) between 1985 and 2009, although the groundwater has risen three to four metres during 1995 and 1996. The Centurion CBD area is therefore considered to not be affected by dewatering. A total of 119 sinkholes have been recorded in the Centurion CBD area since the early 1970s until mid-2012, and their positions are indicated on Figure 2 (page 74). The sinkhole records are under review and many of the events lack detailed information. Most of the records in the database were captured by CGS staff, while some information was also obtained from the City of Tshwane. At present, this database is not available to the public, mainly due to the sensitivity of this information and the effect that it might have on property value. The occurrence of sinkholes has led to the demolition of seven houses and other structures, with loss of money to landowners, while three lives were also lost. The loss of life happened during the rehabilitation of a sinkhole. Photographs 1 and 2 present some examples of sinkholes in the Centurion CBD area. ■ The surface extent of the largest reported sinkhole is 32 m x 23 m and occurred in Lyttelton as a result of a broken water pipe. ■ The deepest reported sinkhole is 10 m and was caused by a leaking sewerage pipe. 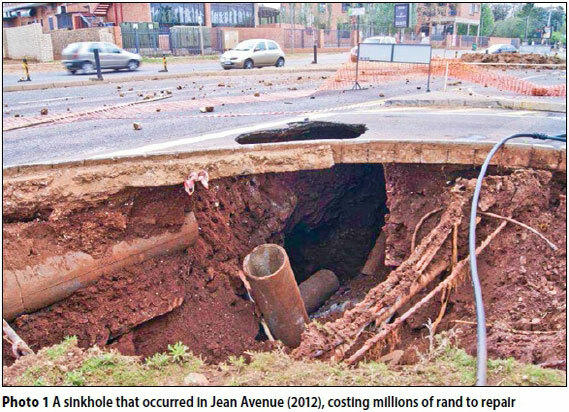 ■ Only one sinkhole occurred on syenite close to the John Vorster and Jean Avenue intersection (detailed information on this event is lacking). ■ A total of 110 sinkholes (92% of database) occurred in the Monte Christo Formation and only 8 (7%) in the Lyttelton Formation. 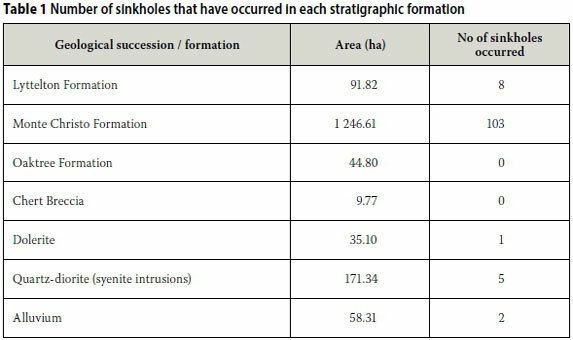 No sinkholes were recorded in the Oaktree Formation (Table 1). ■ Ninety records (75.6%) of the database have information regarding the type of event, with most of the events listed as sinkholes. Graph 1 indicates the distribution of type of instability events. ■ The average sinkhole depth is 3.24 m (data from 47 sinkholes). ■ The average sinkhole diameter is 5.1 m (data from 53 sinkholes). The sinkhole data is being verified by the CGS, with approximately 90% having been completed. The database is not regarded as a complete record of all events and more sinkholes could have occurred in the area. There is no obligation to report these instability events and the records are therefore not always complete. Only 58 of the sinkhole records (49%) have information regarding the possible causes (Graph 2). Although limited, the information shows that 93% of the events in the Centurion CBD occurred as a result of human disturbance of the natural ground conditions, confirming deductions by Buttrick et al (2001). Buttrick and Van Schalkwyk (1995) proposed a scale of sinkhole sizes based on the potential development space that was slightly amended by Buttrick et al (2001), and is widely used to refer to a specific sinkhole size (Table 2). Graph 3 shows the size distribution of the sinkholes based on Table 2, with just fewer than half of the sinkholes (49.1%) falling into the medium-sized sinkhole range (2 m to 5 m diameter). 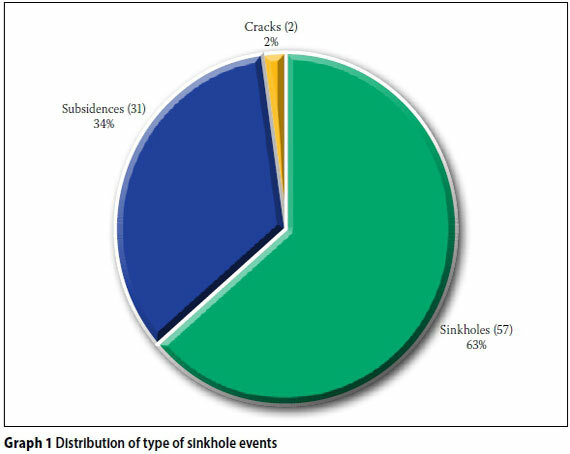 The sinkhole size distribution (Graph 4) indicates that almost 10% of all sinkholes were smaller than 1 m in diameter. Almost a third (28.3%) are between 2 m and 3 m, followed by 13.2% between 3 m and 4 m in diameter. Only 17% of all sinkholes were larger than 10 m, whereas the remaining (83%) sinkholes are less than 9 m in diameter. Graph 4 confirms that medium-sized sinkholes (2 m - 5 m) dominate in the Centurion CBD area. It should be noted that these graphs only represent the available information (45% of records). According to the information in the available sinkhole database, 40% sinkholes or subsidences formed as a result of leaking water-bearing services, 29% as a result of poor surface/stormwater management and 22% as a result of inadequate or poor precautionary measures. 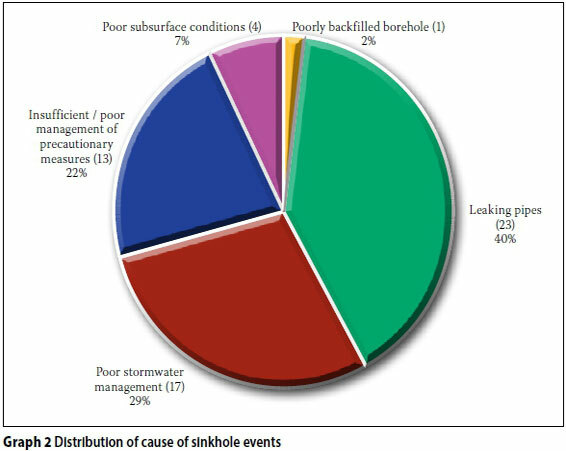 Only one sinkhole (2%) occurred as a result of a poorly backfilled borehole, whereas 7% occurred as a result of poor subsurface conditions. Using limited information (49% of the database has information relating to the cause thereof) it is evident that 93% of the events in the Centurion CBD area occurred as a result of man's disturbance of the natural ground conditions. Since there are no numerical limits to the Scenario Supposition method, draft guidelines for allocation of each hazard class, based on CGS institutional memory and experience, have been developed. This approach is mainly based on the dolomite bedrock depth and the mobilisation potential of the overlying horizons. The size of sinkhole that could develop is again a function of the depth to dolomite bedrock, i.e. the thinner the overburden the smaller size sinkhole is expected and vice versa. Determination of the sinkhole hazard follows a process where an Inherent Hazard Class is assigned to each geotechnical investigation borehole, depending on the characteristics of the material encountered in that borehole. The basic guidelines are provided in Table 3, specifically for the Centurion CBD and the non-dewatering condition, since dewatering has had no influence on stability in Centurion. This hazard determination is merely based on the assumption that a larger size sinkhole will develop in deeper dolomite bedrock environments. This method is based on experience and the understanding of dolomite stability conditions through using the Method of Scenario Supposition (Buttrick et al 2001), but it provides a simplified version of the eight Inherent Hazard Classes; therefore it is proposed as the Simplified Method of Scenario Supposition. Table 4 indicates the distribution of the Inherent Hazard Classes in the Centurion CBD area, with most of the boreholes (953) falling into IHC 3, followed by IHC 4 (857) and IHC 5 (672). 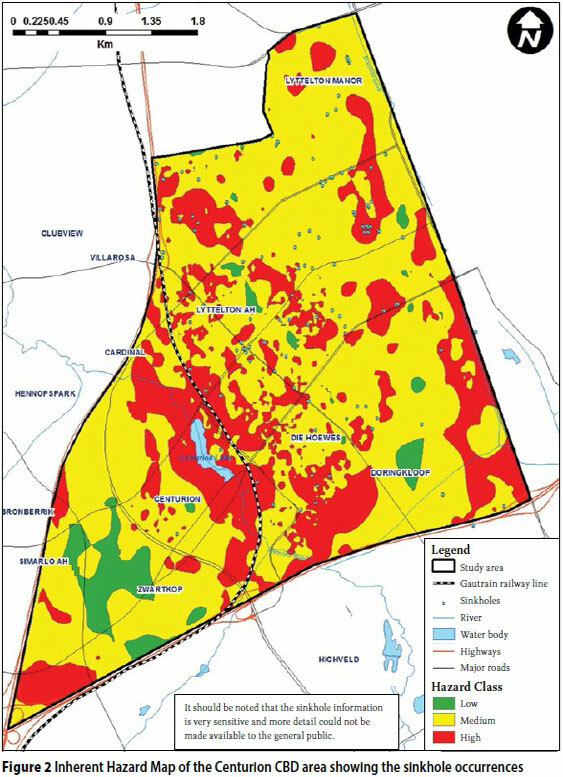 The Spatial Analyst" extension of ArcMap* was used to create an Inherent Hazard Classification Map in terms of the low, medium and high classification (Figure 2). The map indicates that high-hazard conditions prevail in the areas surrounding the Centurion Lake, and are also present along the south-eastern boundary of the Centurion CBD area along Botha Avenue. Isolated areas of high-hazard conditions are also scattered across the centre of the Centurion CBD area, and scattered small areas of low hazard are present, mainly in Zwartkop and Doringkloof. This map has been used to calculate the coverage and surface area of each of the Inherent Hazard Classes, and the respective percentages are given in Table 5. It is evident that two thirds of the Centurion CBD area represents a medium Inherent Hazard for sinkhole formation, and almost a third can be considered as having a high Inherent Hazard for the formation of sinkholes, with only a small portion of the area (4.4%) representing low-hazard conditions. The 119 sinkholes that occurred in the Centurion CBD area were plotted to compare the occurrence of sinkholes against the low-, medium- and high-hazard areas (Figure 2). Table 6 shows the number of sinkholes in each of the hazard areas. The comparison between the hazard map and the previous occurrence of sinkholes generally does not correlate well. The map does show that no sinkholes occurred in the areas classified as having a low hazard for sinkhole formation, which suggests that the delineation of low-hazard areas was accurate and that the classification system defines these areas well. Surprisingly, a vast majority (69.7%) of the sinkholes in the Centurion CBD area occurred in areas classified as having a medium hazard for the formation of sinkholes. It should, however, also be borne in mind that 67% of the area was classified as having a medium hazard for sinkhole formation. Another influencing factor to consider is that the high-hazard areas are generally not developed, whereas the medium-hazard areas are densely developed, therefore more wet services are present in these areas, resulting in a higher number of sinkholes. The position, volume, type and age of wet services also contribute to the type, size and time of sinkhole formation, but this was not studied in detail in this paper. 1. The greater part of land in the area directly south of Pretoria is underlain by dolomite from the Chuniespoort Group of the Transvaal Supergroup. In South Africa dolomite rock has a notorious reputation for the formation of sinkholes and subsidences. Thousands of people reside and work in the Centurion area, where numerous sinkholes have occurred. 2. From the available dolomite stability reports submitted to the Council for Geoscience over the last 30 years it became evident that hazardous conditions exist in the CBD area of Centurion, Pretoria. This first-order sinkhole hazard analysis incorporates the borehole information (3 587 percussion borehole profiles) extracted from 555 dolomite stability reports. 3. The area covers a surface of approximately 1 657 hectares where a total of 119 sinkholes have occurred up to mid-2012. This constitutes one sinkhole per 13.9 hectares or 7.2 sinkholes per square kilometre. 4. It is evident that 93% of the instability events in the Centurion CBD area occurred as a result of man's disturbance of the natural ground conditions. 5. Medium-sized sinkholes prevail in this area, with just less than half of the sinkholes (49.1%) being considered as medium-sized. The database showed that 30.2% were classified as large-sized sinkholes, while small-sized sinkholes constituted 15.1% of the events, with only 5.7% being more than 15 m in diameter, i.e. very large sinkholes. 6. Draft guidelines for allocation of an Inherent Hazard Class have been developed. This approach is mainly based on the dolomite bedrock depth and the mobilisation potential of the overlying horizons. The size of sinkhole that could develop is again a function of the depth to dolomite bedrock, i.e. the thinner the overburden the smaller size sinkhole is expected and vice versa. The sinkhole size is not calculated by using the angle of draw as proposed in the Method of Scenario Supposition (Buttrick et al 2001), although most of the other factors are considered in this methodology, which is based on the same principles of the Method of Scenario Supposition. This approach simplifies the Method of Scenario Supposition, and it is therefore proposed as the 'Simplified Method of Scenario Supposition'. ■ The conditions are not as poor as had always been perceived. ■ The largest area of high-hazard conditions is present in the area immediately north and east of the Hennops River and Centurion Lake. ■ The largest area of low-hazard conditions is present in the area of Zwartkop. ■ The Centurion CBD area is mostly represented by medium-hazard conditions (Inherent Hazard Classes 3and 4), which constitute 50.5% of the boreholes in the area. ■ Only 2.3% of the boreholes in the Centurion CBD area were classified as Inherent Hazard Class 1, whereas 2.8% of the boreholes were classified as Inherent Hazard Class 8. ■ Almost two thirds of the Centurion CBD area represents a medium hazard for sinkhole formation, with almost a third of the area considered as having a high hazard for the formation of sinkholes, and only a small portion of the area (5%) representing low-hazard conditions. 8. 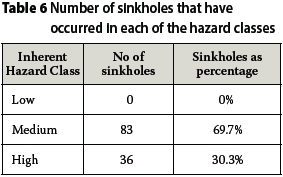 Upon comparison of the hazard map and the previous occurrence of sinkholes, it became evident that the vast majority (70%) of the sinkholes occurred in the areas classified as having a medium hazard for sinkhole formation. Two thirds of the study area is classified as having a medium hazard for sinkhole formation, which is where most of the wet services are present. Leaking wet services have directly caused 40% of the sinkholes in this area, as revealed from available information. 9. Additional research has been conducted, based on the outcomes of this study, which will be presented in the near future. THARINA OOSTHUIZEN (Pr Sci Nat, MSAIEG) completed BSc (Hons) and MSc degrees in Engineering and Environmental Geology at the University of Pretoria in 2 0 03 and 2013 respectively. She started her career in the mining environment where she was involved in highwall stability monitoring and exploration until late 2005, when she joined the Council for Geoscience, initially doing some work on foundation investigations for dams. She currently oversees the Council's dolomite peer reviews, and is doing research in the field of dolomite. PROF LOUIS VAN ROOY (Pr Sci Nat., MSAIEG) started lecturing in the Department of Geology at the University of Pretoria in 1985, and obtained his PhD degree in Engineering Geology in 1992. He lectures to pre- and postgraduate mining and civil engineering, hydrogeology and engineering geology students. His research Interests Include durability of basic igneous rocks for use in civil engineering construction, problem soils, safe development on dolomite land, and rock engineering. He has supervised or co-supervised more than 25 MSc and PhD students, and is author or co-author of more than 30 papers in journals and conferences proceedings. He serves on the councils of both the SAIEG (South African Institute of Engineering and Environmental Geologists) and IAEG (International Association for Engineering Geology and the Environment), and is the Vice President for Africa IAEG.